Farm life is tough during the winter. While it might be nice never to leave the warm house, the chores are never ending. 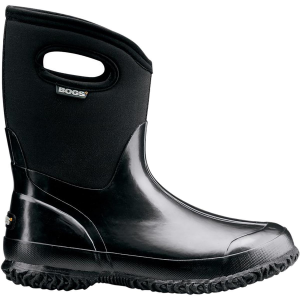 With the Bogs Women's Classic Mid Handle Boot close at hand, you need not fear heading out on muddy days or in snowy weather. The waterproof construction means dry feet when you're mucking out a stall or walking through the snow to get the mail, while the Max-Wick lining means your socks won't be turning swampy if they're trapped in boots all day. Neo-Tech insulation keeps your toes warm for long days in the field while the hardy rubber soles keep you upright in the muck and mire.